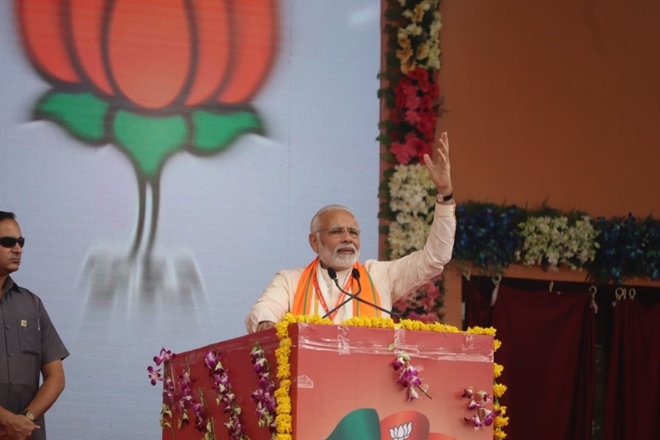 Bhopal, BJP Karyakarta Mahakumbh Rally 2018 Live Updates: Addressing the crowd, PM Narendra Modi took a dig the Grand Alliance of the opposition parties, He said that the 125-year-old Congress party is seeking an alliance out of fear. BJP Mahakumbh Rally 2018 Live Update: Prime Minister Narendra Modi today launched a scathing attack on the Congress party in Madhya Pradesh, and said that the Congress, when in power, harboured feelings of enmity not just for the governments of BJP-ruled states but also for the people of those states. Exhorting the people of the state to bring Shivraj Singh Chouhan back to power for the next five years, Modi said that the Centre and the Shivraj government have given speed to the pace of development in the state and the time had come to make a leap. “I need 5 more years to serve the people of Madhya Pradesh,” the Prime Minister said, adding that the nation will progress only if states develop too. Addressing the BJP’s ‘Karyakarta Mahakumbh’ here, he also said that it is a matter of great pride that the BJP is currently ruling 19 states, adding that it is also a greater achievement to be the world’s biggest political party. Modi also heaped praise on BJP president Amit Shah for his qualitative leardership. According to the BJP, workers from each district of the state have arrived in Bhopal to attend the mega rally of PM Modi and Amit Shah. Ahead of leaving for Bhopal this morning, Modi in a tweet said that he is looking forward to interacting with the hardworking workers of the Madhya Pradesh unit of the BJP. PM Modi also attacked the Congress over recent Pakistan 'links'. he said that the Congress party is scouting for allies outside India. The PM said this while referring to the recent developments where ina few Pakistani ministers had retweeted Rahul Gandhi's tweet targeting the BJP-led NDA government over Rafale deal. Modi said that the BJP government believes in social justice. He said that vote-bank politics has caused immense damage to the country in 70 years after Independence. "Vote-bank politics is like a termite for the country." Taking a dig at the Grand Alliance of the opposition parties, he said that the 125-year-old Congress party seeking alliances purely out of fear. He said that Congress party is not learning from its past mistakes and indulging in such politics. "Congress not ready to introspect why it has been reduced to 44 seats in Lok Sabha because of its arrogance"
PM Modi said that the Congress party cannot tolerate a chaiwala or a poor man's son in seat of power. He said that the Congress is spreading lies as it believes in dynastic politics. PM Narendra Modi attacked the Congress over dynaticpolitics. He said that in a democracy there is no place for dynastic politics. PM Modi also appealed for ending the vote bank politics. He said that the BJP never believed in indulging in vote bank politics. Modi also took the opportunity to attack the Congress party for playing appeasement politics and accused it of harbouring hatred for people of BJP-ruled states. PM Modi said that the BJP workers have always followed the footsteps of Ram Manohar Lohiya, Mahatma Gandhi and Deen Dayal Upadhyay. He said that such people are today dominant in the country's politics. The PM said the BJP can never forget that Gandhi, Lohiya and Deen Dayal. Addressing the gathering here, PM Modi said that it is matter of pride to be in power in 19 states, but its a greater achievement to be the world's biggest party. On NRC issue, Amit Shah said that the exercise carried out in Assam has helped the government to identify 40 lakh illegal infiltrators. He said that the government is committed to serving its own people. He added that the BJP's priority is to provide security to the people of the country and safeguard the borders. But the Congress part party is interested in doing politics of over the issue of NRC. Amit Shah said that when the BJP was formed, the party had only 10 workers. But today, the BJP has 11 crore workers and is the world's largest politics party. Shah said that the BJP is currently ruling the 70% of the country's land under the leadership of Narendra Modi. He asked party workers to connect with the people at every booth across the country and tell people about the schemes launched by the government. BJP president Amit Shah also attacked the Congress party pushing back Madhya Pradesh during their rule. He said that Congress president Rahul Gandhi is daydreaming of winning the elections in Madhya Pradesh, Chhattisgarh and the Lok Sabha polls next year. He said that the BJP will return to power in all the election-bound five states and also in 2019. Addressing the rally here, Madhya Pradesh CM Shivraj Singh Chouhan launched a scathing attack on the Congress party and its president said. He called Rahul Gandhi a 'fun machine'. Madhya Pradesh Chief Minister Shivraj Singh Chouhan in a tweet claimed that today's 'Karyakarta Mahakumbh' of the BJP is world's largest conference of workers. He said that PM Modi's visit to the state ahead of the Assembly polls will help boosting the morale of the party workers. According to the BJP's claim, about 13 lakh party workers are expected to participate in the 'Karyakarta Mahakumbh' rally. The party has claimed that workers from all 230 assembly seats in the state have arrived in the capital to take part in the programme. The rally is being organised ahead of the Assembly polls in the state. The state will go to polls in November-December along with Chhattisgarh and Rajasthan. The tenure of Madhya Pradesh Legislative Assembly expires on January 7, 2019. Prime Minister Narendra Modi, BJP president Amit Shah will address the 'Karyakarta Mahakumbh' rally shortly. Madhya Pradesh CM Shivraj Singh Chouhan is also present on the stage. The Bharatiya Janata Party is ruling this central for the last 15 years. In the previous assembly polls, the BJP had won 165 of the 230 seats. This time also, CM Chouhan who is seeking fourth consecutive term in the office, has claimed that the saffron party will retain the power.